For the full text of “Albanza,” by Martin Espada, visit the poet’s website at MartinEspada.net. In the prose poem “Alabanza,” acclaimed poet Martin Espada honors the forty-three members of Local 100 who died in the attacks on the Twin Towers on September 11, 2001. These workers staffed the Windows on the World restaurant, located at the top of the North Tower. The first two stanzas of “Alabanza” begin with deft, quick portraits animated by the music of bread and eggs: a cook from Fajardo whose blue eyes echo Spanish and American invasions of Puerto Rico. The tattooed “oye” on his shoulder, an exclamation that shares shades of meaning across several languages and cultures, underlines the transcendence of words. Each worker carries familial histories in bodies as they move through daily routines of feeding customers. Espada’s next sketches build on these personal moments by intentionally linking histories of structural conquest and labor movements in the Caribbean. The roll call of migrant and immigrant workers listed in this poem serve as remembrance. In its breathtaking diversity, it is also a reminder that our cities are points for labor flows affected by agrarian and trade agreements and military campaigns. 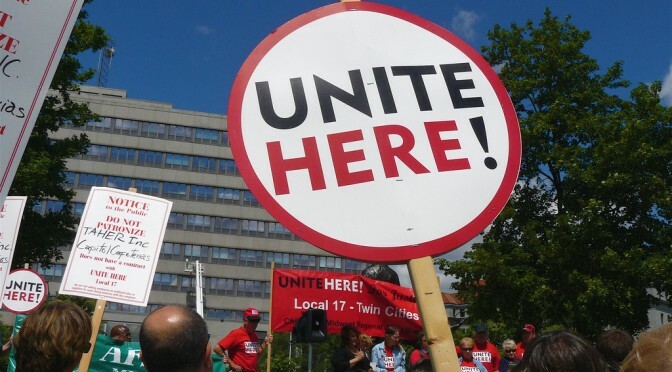 Espada avoids commenting on the attacks on the Twin Towers themselves, but instead directs us to the unspoken lives and labor struggles represented in the poem. As the poem opens outward, it moves beyond our imaginations. Learn more about Martin Espada. On June 12th, 2015, the Murphy Institute Blog Arts & Culture Editors hosted the first ever Creative Arts Night at the Murphy Institute. In this video clip, Dr. Randall Horton, Assistant Professor of New Haven College of Arts and Science, explores how his writing life as a poet began during his commuted sentence in North Carolina correctional facility. This talk was part of the Creative Arts panel event in June 2015 at the Murphy Institute. In tracing his creative and academic path, Horton demonstrates the connections between the creative arts, sociopolitical consciousness and grassroots organizing. He shows how writing programs such as the Cave Canem and the Asian American Writers’ Workshop can serve as alternatives to institutional fine arts programs that are inaccessible to many writers in underserved communities. In providing mentoring and workshop space, these organizations offer much-needed creative instruction and facilitate counter-perspectives to the production emerging from BFA and MFA programs. 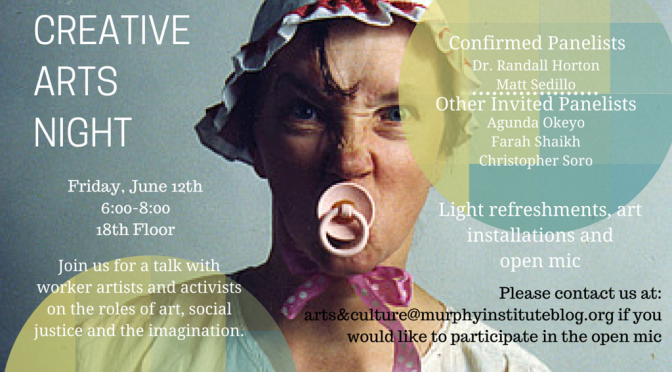 On June 12th, 2015, the Murphy Institute Blog Arts & Culture Editors hosted the first ever Creative Arts Night at the Murphy Institute. In the coming weeks, we’ll be posting some footage from our esteemed panelists and performers. Here, activist, filmmaker and writer Agunda Okeyo discusses her unique role in the world of art, social justice and the imagination. Agunda was also featured in this month’s issue of Time Out NYC in a section featuring Best Comedy Shows run by females. Join the Murphy Institute for our first Creative Arts Night, to be held on the 18th Floor of the Murphy Institute, located at 24 W. 43rd St., on June 12th from 6-8pm. Hosted by Murphy Institute Blog Arts & Culture Editors, the event will feature panelists Randal Horton and Matt Sedillo, whose work was recently featured on this blog — plus art installations, an open mic and more. I have a tendency to think and write in a stream of consciousness when it comes to poetry and short stories. I have wanted to write something like Mind Graffiti (below) for a couple of years now. It was like a huge itch in the back of my mind and it took me a very long time to get the right words together. Matt Sedillo is a poet, worker and artist living in Los Angeles. His book of poems “For What I Might Do Tomorrow” was released in 2010 by Caza De Poesia. Here, the two time national slam poet answers some questions posed by Arts and Culture co-editor Samina Shahidi. The poem “The Devil” by Matt Sedillo. Video directed by Elefante. We’ve been introduced to Matt Sedillo from your poems. What else should readers know about you? I would like people to know that I am a working artist and a curious soul so I do like to travel. Outside of being an artist, I am also really interested in connecting with people about many of the problems we are collectively facing today. What is it like to be a young, Mexican-American poet today? I am based in Los Angeles, so my experience as a Mexican American might be different than someone living in Chicago or Houston or places of recent migration like New York or Detroit. Living in LA my experience as an artist and my general experience as a person on that front is great. I feel rooted in the life of the city in its past, present and future. There is a great scene out here with some many young talented Chicano artists many of them dear friends of mine but there are also deep roots and deep connections with the previous generations as well as the one coming in after me. Thank you for calling me young, by the way. That is happening less and less these days. What challenges do you encounter (as a poet, and/or additional intersections) and how do you meet them? As a poet — and I think this is true of most performance artists — it’s sometimes hard to get people to understand that a performance or a service should be compensated. For instance, if I crafted jewelry I doubt people would just ask for free necklaces; it is understood in the production of goods there is expense. That same understanding does not always translate. I imagine plumbers and mechanics are often by family members to help out in ways that a restaurateur might not be asked — again, that’s service vs. physical production. I don’t know. But that is the real primary struggle I face as a poet, just trying to live as a poet. As to the creative part, I am lucky to still have a lot of energy and ideas. I hope that never changes. Who are your poetry people (i.e., writers who influence you, with whom you organize)? I work a lot with David Romero and Yazmin Monet Watkins. The three of us have collectively formed Marginalized Voices and were honored enough to present a major workshop at last year’s National Conference on Race and Ethnicity. I also have been fortunate enough to forge a poetic connection and friendship with former San Francisco Poet Laureate Jack Hirschman. Most recently, I co-developed a poetry workshop with current LA Poet Laureate Luis Rodriguez. Luis is an amazing man and I am truly honored to be working with him. He has come into my life several times and delivered so much encouragement. It is hard to believe I am actually now working alongside him. What would you say to a writer starting out? I would tell a writer to take serious assessments of their goals and then ask the question “do I truly believe I deserve to achieve my goals?” If you do not believe you deserve to achieve your goals, you will self-sabotage along the way. People are wonderful and full of so much capacity, so much talent, so much latent expression, but we are also riddled with doubt. Those doubts need to be addressed head-on. Once we are firmly rooted in our highest capacities and have the confidence to proceed, things fall in place. Immerse yourself in the direction you most want to pursue and paths will make themselves apparent. For those who are already in the right head space the more practical advice I can offer would be to create the greatest amount of visibility possible given your current resources, knock on as many doors as possible and collect your work in cohesive formats that are ready made to be sent. Prepare yourself for great things. Prepare yourself to succeed. You deserve to be happy. The world awaits your voice. It just doesn’t know it yet.